The principles of a fair trial are preserved by a wide array of international agreements and conventions that apply to citizens as well as the state. The most significant of which are the Universal Declaration of Human Rights (UDHR) and the International Covenant on Civil and Political Rights (ICCPR). The state of Lebanon has ratified both and has subsequently reflected them in its laws. 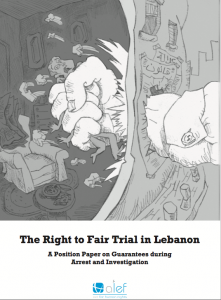 The basic principles of fair trial are present in the Lebanese justice system, such as the unconditional right to resort to lawsuits, the right to legal counsel, the burden of the proof falling upon the accusation, and the prevention of being prosecuted twice for the same crime. Despite these local and international obligations, Lebanese criminal justice practices have not always functioned according to these agreements. This paper has two main components. The first section is a detailed analysis of the guarantees of fair trial during the periods of arrest and investigation, while the second is a focus on the key components of fair trial guarantees. This position paper will present both components by evaluating Lebanese state practices, and recent trends in the justice system.